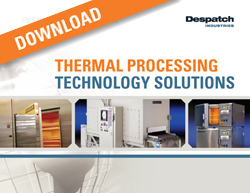 Despatch's RBC Burn-In Benchtop Ovens offer maximum flexibility for small lot qualification testing, burn-in, reliability testing, and research and development. The stackable burn-in benchtop ovens allow users to run concurrent tests utilizing different temperatures or different cycle times. They are ideal for qualification testing with small lots, because a new test may be started on the second chamber while the first test is still in progress. This oven configuration is designed to maximize throughput and equipment utilization. The oven may be placed on a benchtop, or stacked to conserve valuable floor space. The small footprint makes these ovens ideal for test labs or production areas where space is at a premium. The Protocol 3™ is a microprocessor based temperature and hi-limit controller that is easy to use for both simple and complex applications. .The large, bright LCD displays temperature and detailed information on oven status with clear real-text messages and simplifies programming of temperature and time parameters with user-friendly menus. Datalogging function allows for logging important process data for reporting and analyzing. Data. files can be exported via the USB port on the front of the controller or through the communications. Modbus communication (RS485) is standard or you can select the optional ethernet connection. Remote operation, programming and data logging | The Despatch Protocol Manager network utility software enables the operation of up to 32 Protocol 3™ and/or Protocol Plus controllers from a single, remote PC using RS485 communication. High volume recirculation fans maintain consistent, uniform temperatures required by MIL STD 883 while removing heat generated by the load. Despatch stackable burn-in benchtop ovens are ideal for high dissipation applications.